The bakers can pick the cookies of their choice and bake. 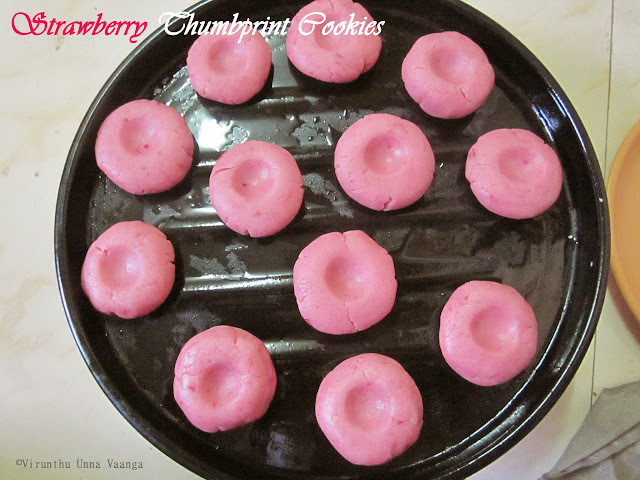 And here am posting the strawberry cookies. 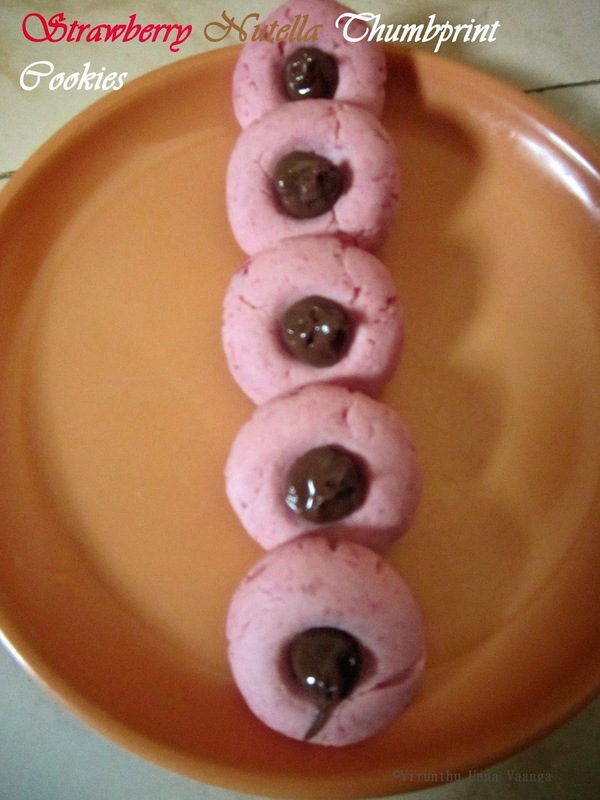 I made 3 out of 4 cookies and I will post one by one in coming days. 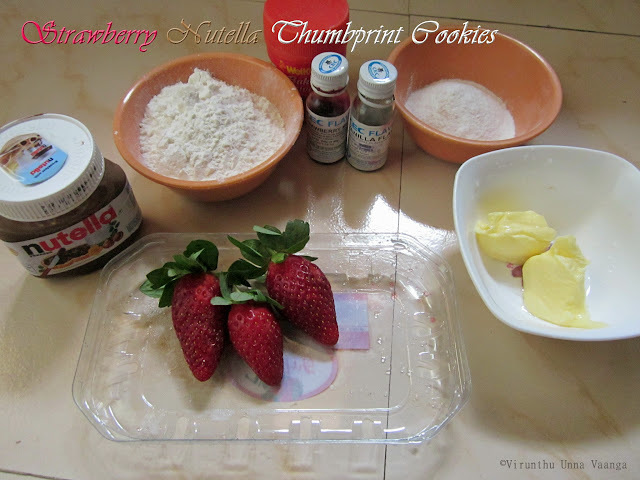 In the cookies, I added strawberry essence to get rich flavour. I baked half of the quantity in original recipe. 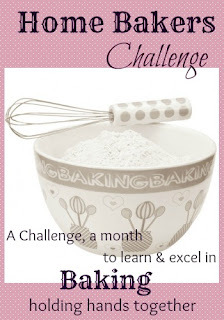 Sift the flour, salt and baking powder together in a mixing bowl. Set aside. 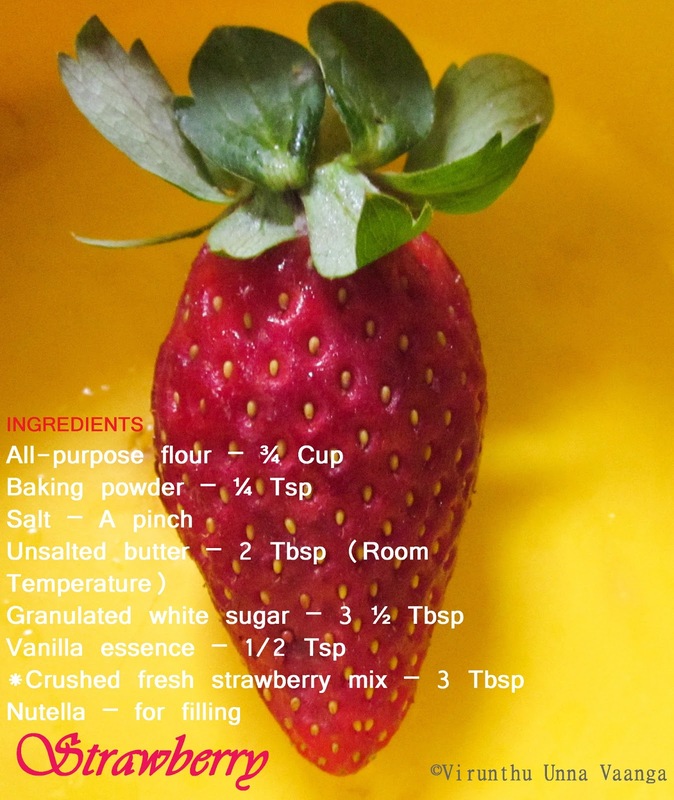 In another bowl, cream the softened butter and sugar using a hand whisk or electric blender for about 4 minutes. Fold in the flour mixture with the butter mixture gently to form dough. The dough will be soft and a little sticky but not loose. Do not over mix. You might need to oil your hands and bring the dough together. Once combined, cover the dough with plastic cling film and refrigerate for ½-1 hour. Line your cookie sheet with a parchment paper. Take out the refrigerated dough, lightly oil your palms and make small balls with it. 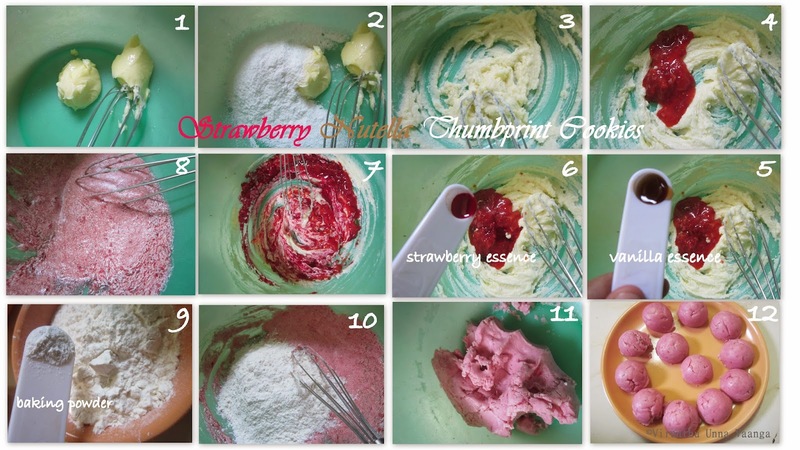 (You can use 1 Tbsp or ice cream scoop for even measurement). Put the balls on the cookies sheet and press down slightly to flatten out. 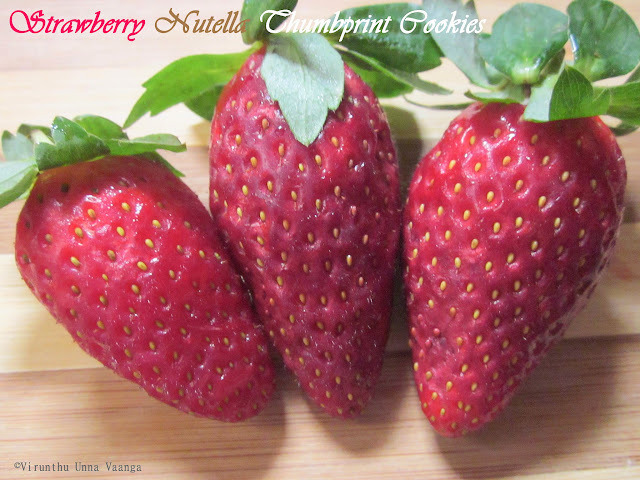 With the help of your thumb or back of a tea-spoon make a small hole in the middle of the cookies where you’ll fill the nutella after baking. If at this stage you feel that the butter in the cookies is melting, refrigerate again for about 15 minutes. Bake the cookies in the oven for about 8-12 minutes or until the bottom starts turning brown. Do not bake them beyond 12 minutes. These will continue to cook after you take them out of the oven. Take out the cookie sheet from the oven and using the teaspoon again press out the hole in the cookies. You will not able to do this after the cookies have cooled. Once cookies have cooled, fill in the nutella in the little holes in the cookies. You can replace the nutella with your choice of filling like melted Jam or melted Chocó chips or with nuts. Do refrigerate the dough to work easily. Every oven is different; the time of baking may vary from appliance to appliance. 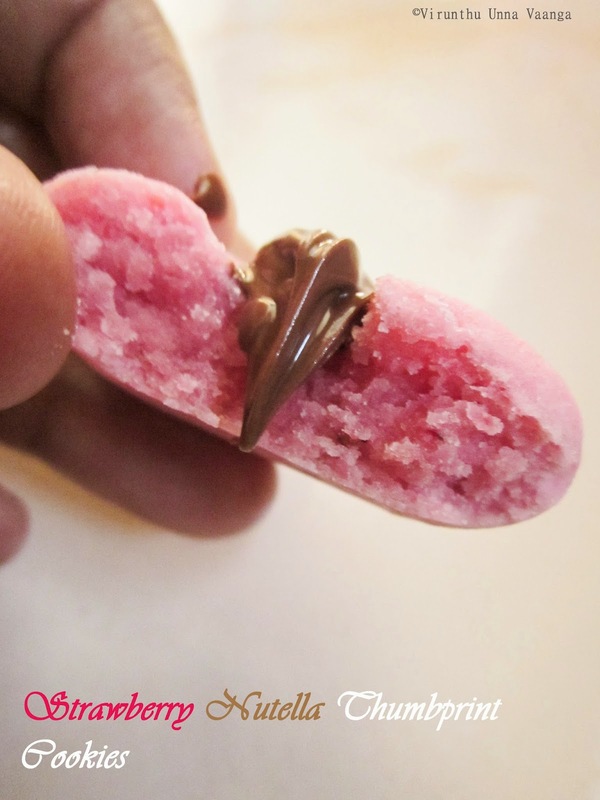 AWESOME TASTE OF PRETTY PINK!!! Thank you so much Priya akka and HBC team to give opportunity to host the Month!!! I enjoyed baking… Happy Baking!!! 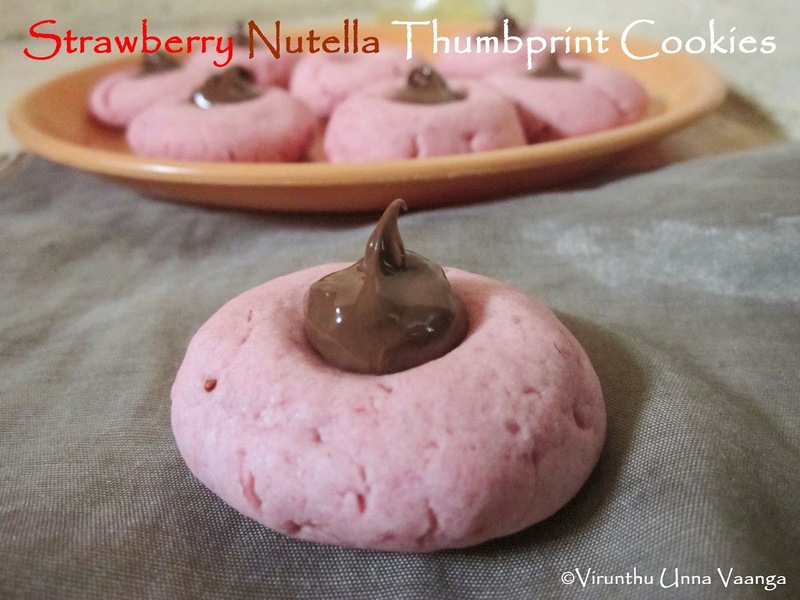 summa pataiya kalapura viji :) one post after another.. samma speed le irrukae da nee inniku :) like those strawberry flavored cookies.. yum yum.. Thanks VIji,love ur small intro about the group and ur cookies suggestions as well, am sure all the members would have enjoyed thoroughly baking and munching ur choice of cookies. 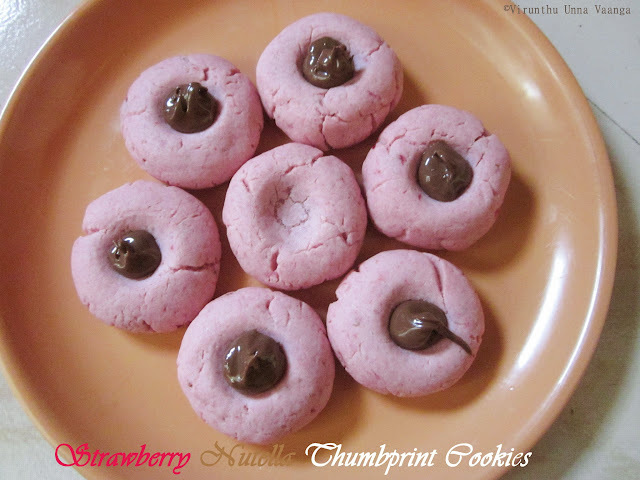 Thumprint cookies looks scrumptious and extremely elegant Sis. Looks very yummy and tempting. Beautiful Intro to the group!! Lovely clicks and gorgeous cookies.....Thx so much for all the recipes & tips Viji; we had so much fun baking it and enjoyed munching them too! My post might be a bit late, as I'm busy right now with some joining formalities at my new workplace....hope it's ok??!! 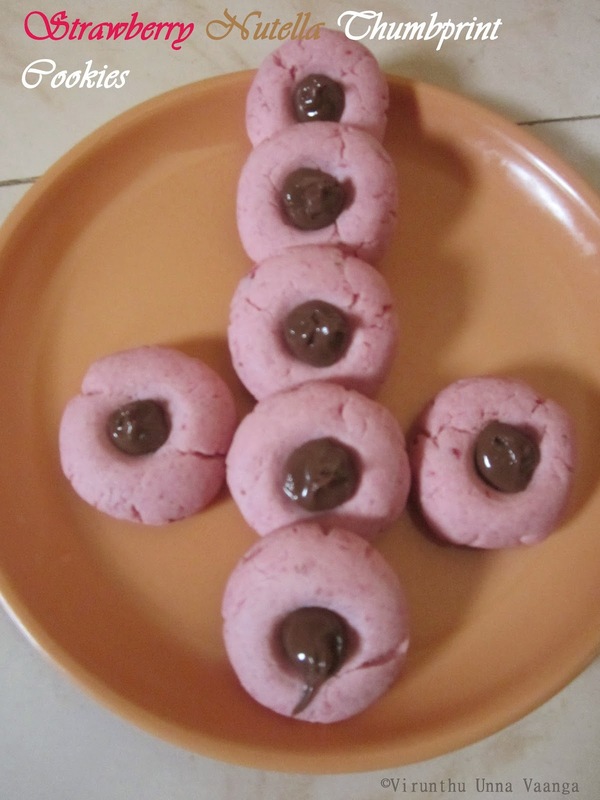 Beautiful cookies Viji. I saw it in Tanvi's blog earlier. 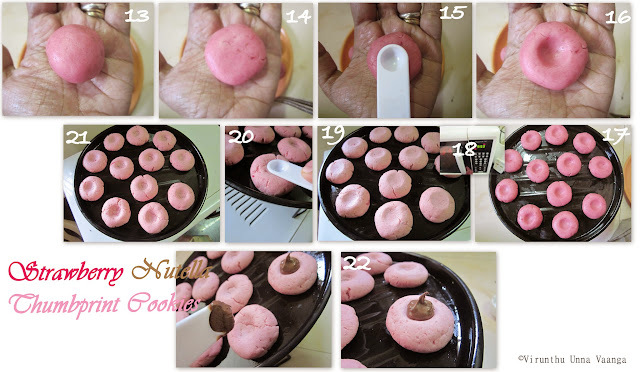 Thank you Viji for choosing these delicious cookies. I loved baking them. 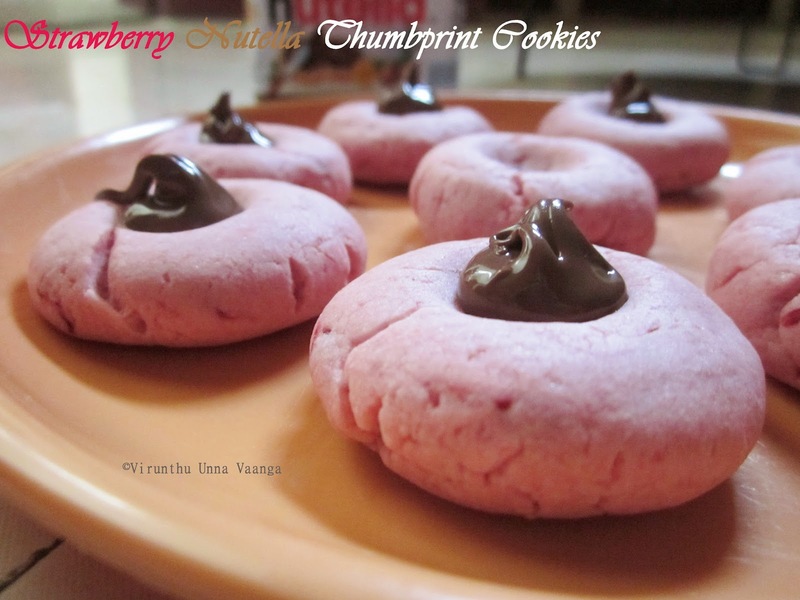 wow.perfectly made thumbprint cookies looks so delicious n tempting, lovely clicks viji...am yet to make these cookies, will bake it this weekend.. Such cute cookies.. Loved it Viji... 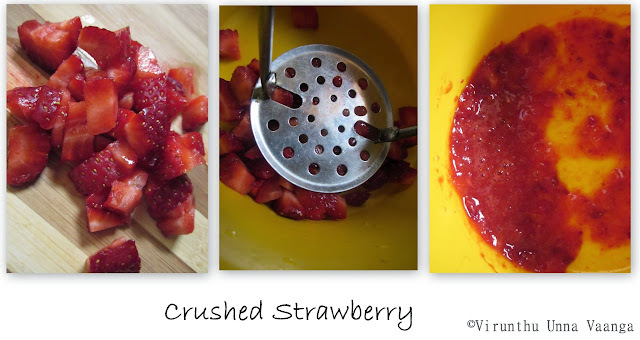 I'm sorry for the late posting but did post the recipe today.. Do check it whenever ur free..